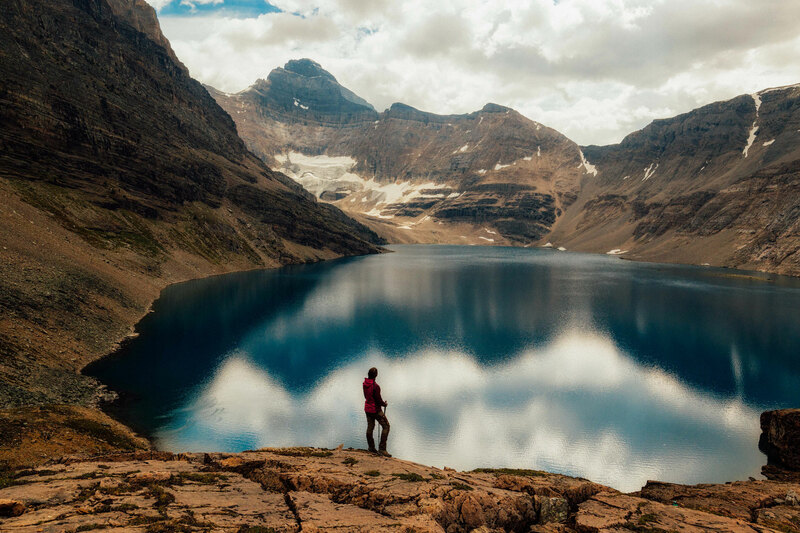 The trip to Lake O'Hara is the most sought after backcountry outing in all of Western Canada. Why you may ask? Personally, I think it's a matter of easy accessibility. Lake O'Hara is the only backcountry experience, that I know of, where it's possible to go by cheap motorized transport. 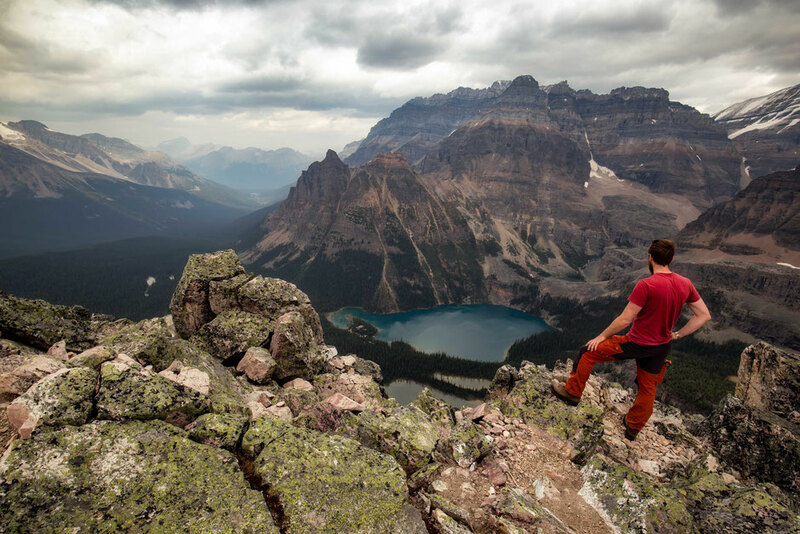 In other backcountry campsites like Mount Assiniboine or the Berg Lake Trail there is a shuttle in form of an expensive helicopter flight, but unless you have few hundreds dollars to spare, you are destined to hike with your heavy gear. Compare this with a 15$ shuttle bus ride to Lake O'hara campground and you start to understand why it is so popular. The other, fairly obvious reason is the stunning views and plethora of world class hiking trails and climbing routes. Combine the above two reasons with the cheap and very well maintained campsite accommodation and you've got a world class backpacking experience at a very little effort and cost! 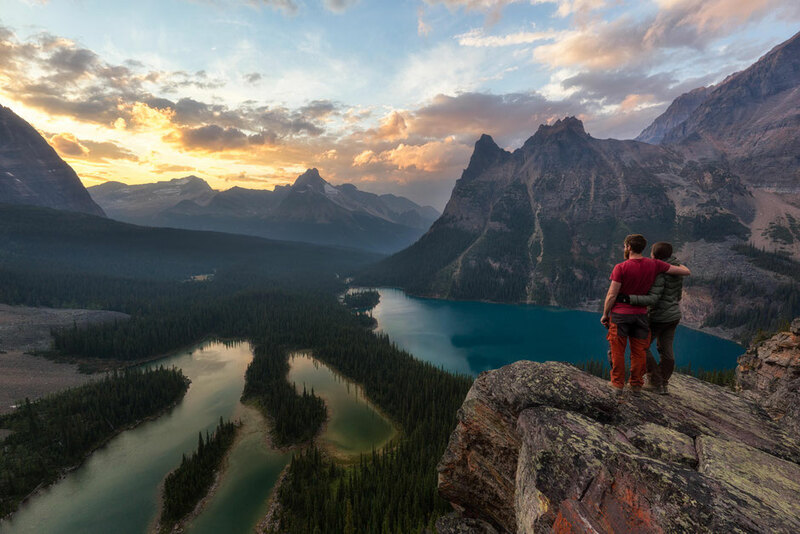 When reservations open, Parks Canada is swamped by thousands, sometimes tens of thousands of daily phone calls by hopeful adventurers, like yourself, chancing their arm to get an opportunity to visit this gem in the heart of the Canadian Rockies. 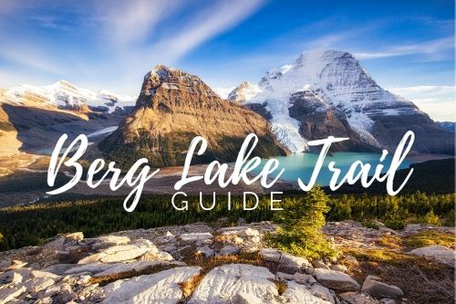 This guide has hints and tips on the best way to make reservations, the types of accommodation available at Lake O'Hara and useful information on many of the hiking trails and photography spots in the area. There are two choices when contemplating visiting Lake O'Hara in the summer: hiking in or taking the bus. Choosing the latter is an obvious pick for me. The 22km round trip hike to the base of Lake O'Hara isn't particularly strenuous but walking along the old fire road through the forest isn't exciting either. I have done it in the winter when the shuttle wasn't operating. Taking the bus takes a lot more sense. 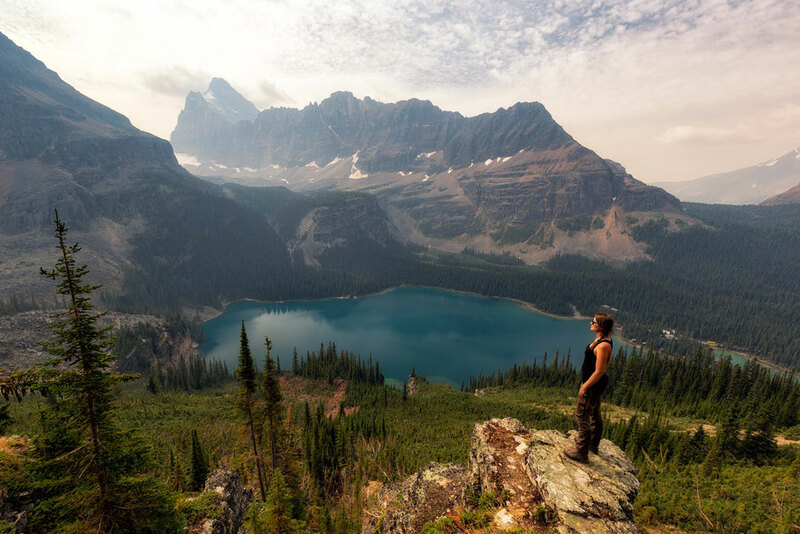 You want to preserve your energy to be able to complete at least one of the many day hikes in the Lake O'Hara region. "Welcome to the most exclusive and hard to get to bus ride in British Columbia". That's what Parks Canada officer told us when we finally settled in our seats. The bus reservations are available from the end of April and are very difficult to secure. They usually require a good few days of calling and swearing at your phone and the outdated reservation system. The exact date changes each year, but the time 8am MDT doesn't. Cancellations and changes will incur fees. If you are not planning on staying overnight you can catch an inward shuttle daily at either 8:30 am or 10:30 am. Outward buses leaving the park are available at 16:30 and 18:30. To walk to Lake O'Hara you do not need a reservation. The trailhead lies 100m away from the Trans Canada Highway in between Lake Louise and Field. The 11km slightly uphill hike is generally uneventful with the occasional glimpse of beautiful peaks as you wind through the trees. 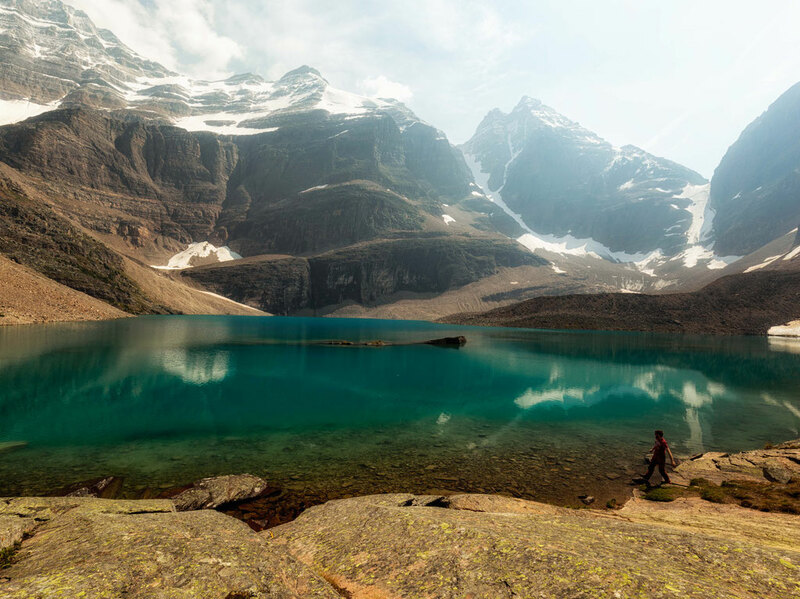 A quick walker can get to Lake O'Hara in 2 hours from the car park. The campsite at Lake O'Hara operates on a reservation basis. It has 30 individual sites, running potable water, cooking shelters, daily cleaned toilets, individual bear lockers and evening activities. It's honestly the best backcountry campground I've ever been to. Reservations open at the start of April, the exact date changes from year to year. Bookings are available 3 months in advance of your departure. So for example if you want a booking for July 30th, you need to call on April 30th. The sites are normally all booked within the first couple hours of the day and bookings can currently only be made by phone, which makes the whole process extremely frustrating. The number is +1-250-343-6433. During peak season the hotline is open 7 days a week but toward the start and end of the season it's only open Monday to Friday. This means that on Mondays there's availability for the entire weekend just over 3 months in advance, increasing your chances of being successful. You can book for a maximum 3 nights, up to 6 people and two tent sites (one tent per site). Whilst making reservations for the campsite you can also book the shuttle bus. To secure a spot during summer in one of the two Elizabeth Parker Huts you must enter the lottery. I am not joking! 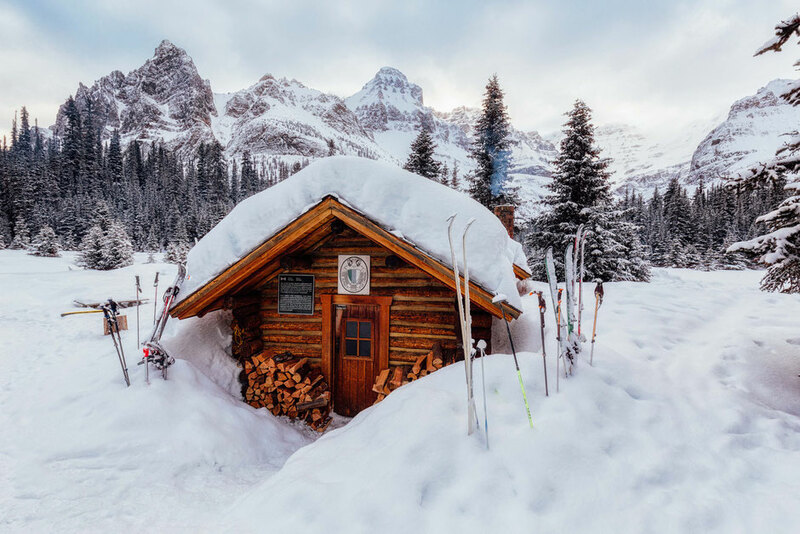 Operated by the Alpine Club of Canada (ACC), the huts can hold up to 20 people in the winter and 24 in the summer. They have a wood heater, propane stoves and basic utensils and, of course, outhouses. 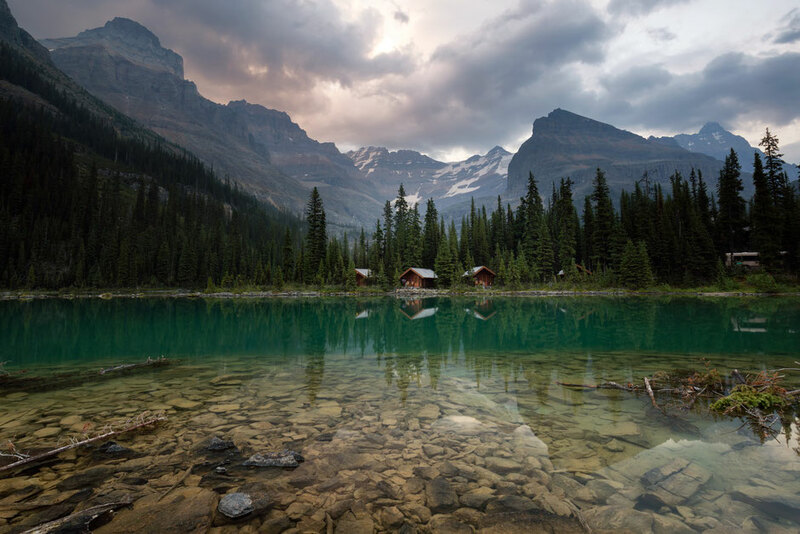 The huts are only a 1km slightly uphill walk from the bus stop at Lake O'Hara and, unlike the campground and the lodge, are open all year round. 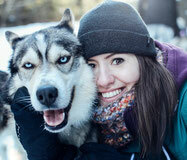 Bookings in the winter, apart from Christmas and New Years, are generally stress free. The summer however is a whole other story. The lottery costs 10$ per entry, opens at the start of October each year (dates are subject to change) and closes at the start of November. At the time of entering the lottery you select the date and duration of stay you're after. If you pick a popular date (i.e long holiday weekends) the chances of you winning are heavily reduced. You can enter as many times, on as many different dates as you'd like, but each time paying 10 dollars. Only winners of the lottery are contacted and upon winning you must pay a 20% non refundable deposit. If successful, you can also book the bus shuttle with the ACC. Reservations are not transferable and a stringent cancellation policy is in place. Although being a member of the ACC will not affect the chances of winning the lottery, it is a requirement for the individual completing the booking, but not the entire party. During peak season, the Elizabeth Parker Huts cost 35$ per person per night for ACC members or 45$ pp/pn for non members. For more information on the absurd lottery system, cancellation policy, price lists and ACC membership you can visit the Alpine Club of Canada's website. By far the most luxurious accommodation option at Lake O'Hara. 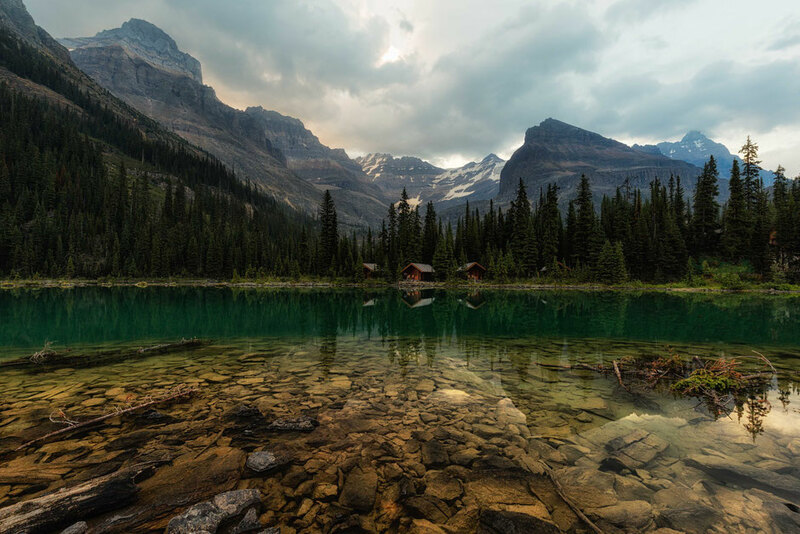 The lodge has several different styles of accommodation: the shore cabins which, as the name indicates, lie on the shore of Lake O'Hara; the lodge rooms that are around 50 m away and the guides cabins on a nearby grassy knoll. The most luxurious lakeshore cabins book out up to 3 years in advance and cost almost 1000$ per night (for 2 people)! Moreover a minimum 2 night stay policy is in place. All food, afternoon tea, the bus trip, access to canoes, guided excursions and all taxes and gratuities are included in the booking. The cheapest option are the guides cabins which cost 1645$ (for 4 people). This may sound expensive in comparison with the campground or the Elizabeth Parker Hut but you get a lot in return. Incredible gourmet experiences with some of the best chefs in Canada, tours with certified international mountain guides, and most importantly, a proper comfy bed and a real toilet! Although making the campsite reservation can be a bit of a hassle (it took me 5 mornings of continuous calling to make one for my summer trip) once you're at Lake O'Hara you'll forget all about the stresses and strains of those expensive phone calls. There are viewpoints that are of indescribable beauty, some of which are a 10 minute stroll, some of which are a full days work. 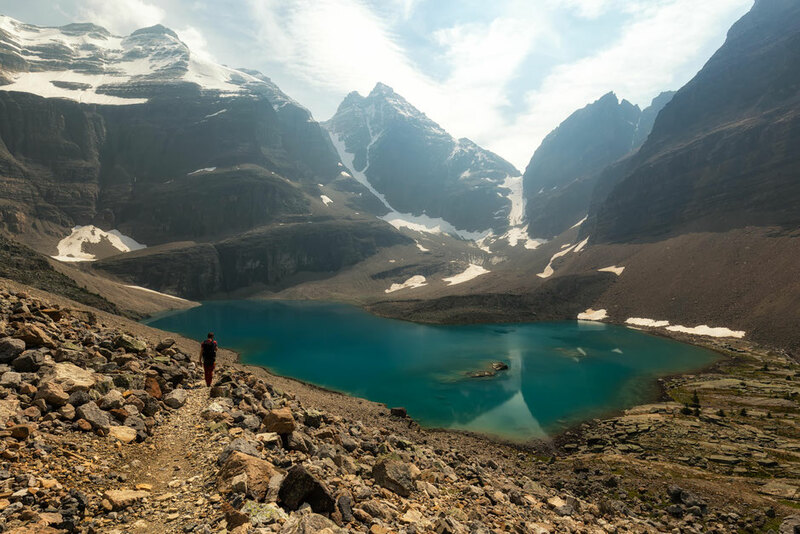 If you want to combine many of them, then consider doing the entire Lake O'Hara Alpine Circuit - one of my favorite day hikes in the Canadian Rockies. The trail is marked by a blue square with two vertical yellow lines that you'll see painted on the rocks and trees on the trail. Although trails are well marked and easy to follow I highly recommend getting a map of the trails prior to visiting Lake O'hara. The route up from the Lake Shore to the Wiwaxy Gap is a steep but beautiful hike. As it switchbacks sharply through the bush you'll soon be above the tree line looking down at Lake O'Hara with the Schäffer Ridge in the background. 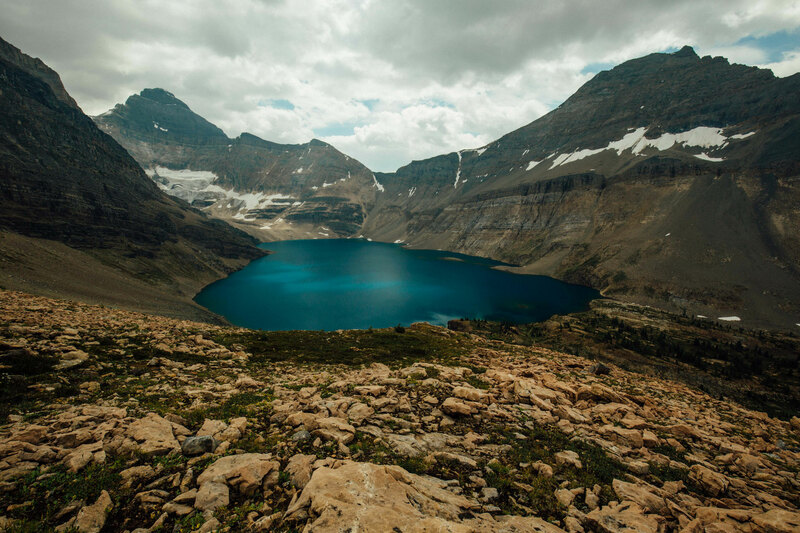 Once you've made it to the Wiwaxy Gap, the highest point of the Alpine Circuit, the descent on the Huber Ledges to Lake Oesa is a great, albeit strenuous, introduction to hiking at Lake O'Hara. The Lake Oesa Trail is the less serious version of the Wiwaxy Gap and the Huber Ledges. It takes a more gradual ascent through the forest and passes the Victoria Falls, Victoria Lake and Lefroy Lake on it's way. The Yukness Ledges connect Lake Oesa with the Opabin Plateau and are a prominent feature of the Alpine Circuit. They are 2.3km in length and mostly flat as they navigate around Yukness Mountain. The Opabin Plateau is home to a multitude of small tarns and larger alpine lakes. The Cascade Lakes, Moor Lakes, Hungabee Lake and the largest Opabin Lake all call the plateau home. In the summer sun they all shimmer with a variety of blues, aquamarines and emerald greens but for me, the highlight of the plateau is the Opabin Prospect. 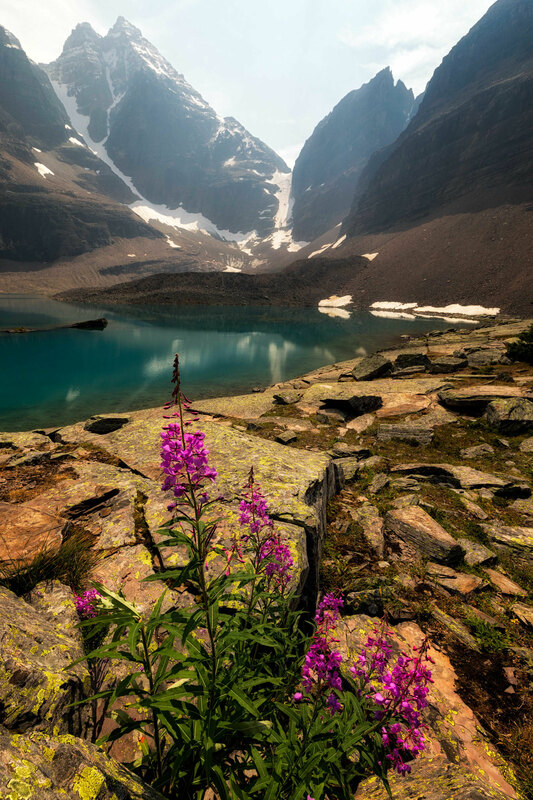 The Opabin Prospect is a rocky outcrop which looks west over Lake O'Hara and the adjacent Mary Lake. It holds a special place in my heart as it's where I got engaged!!! Schäffer Lake is a small alpine tarn less than 1km away from The Elizabeth Parker Hut. From the campsite it marks the halfway point to the much grander Lake McArthur, which is the largest lake in the area. The easy to follow trail is mostly uphill from the campsite and is really rewarding. 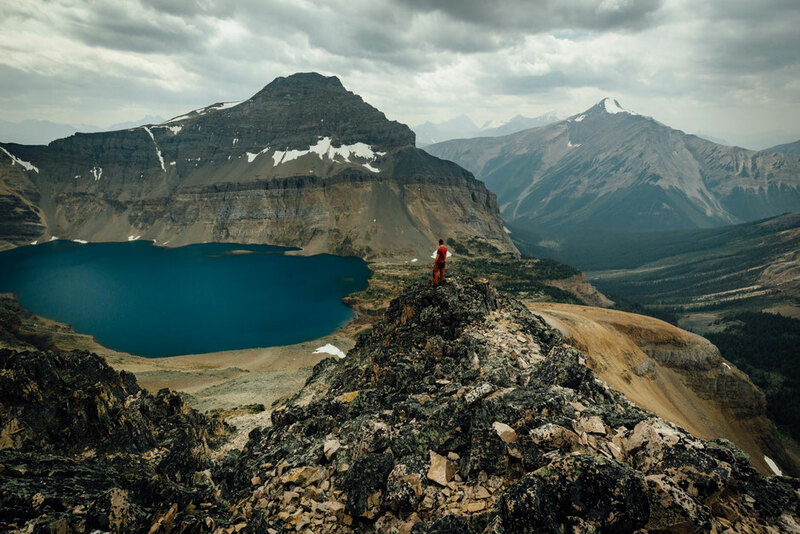 A bit of a nerve wracking scramble to the summit of Mount Schäffer offers views of both Lake O'Hara to the north and Lake McArthur to the south. Two Lakes that from most vistas are separated by the Schäffer Ridge. 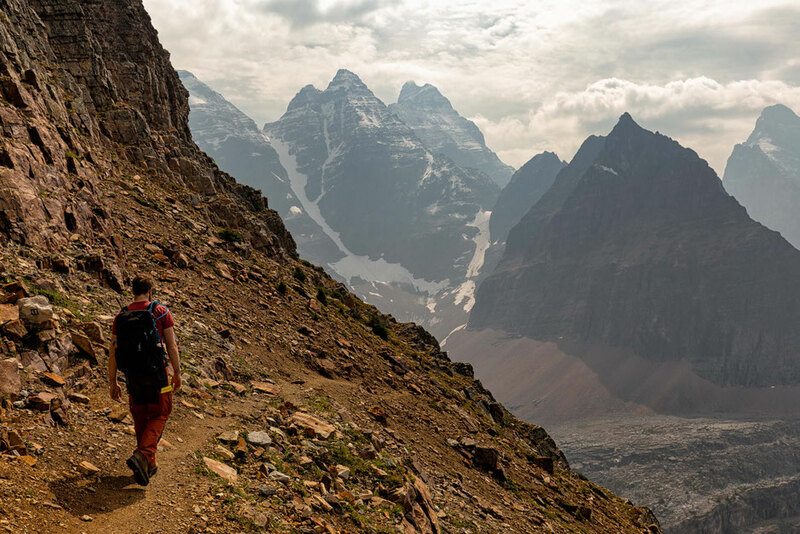 The not-for-the-faint-hearted trail ascends from Lake McArthur a further approximately 1.5 hours. Not an easy achievement but one with great reward. Scrambling involved so be prepared. 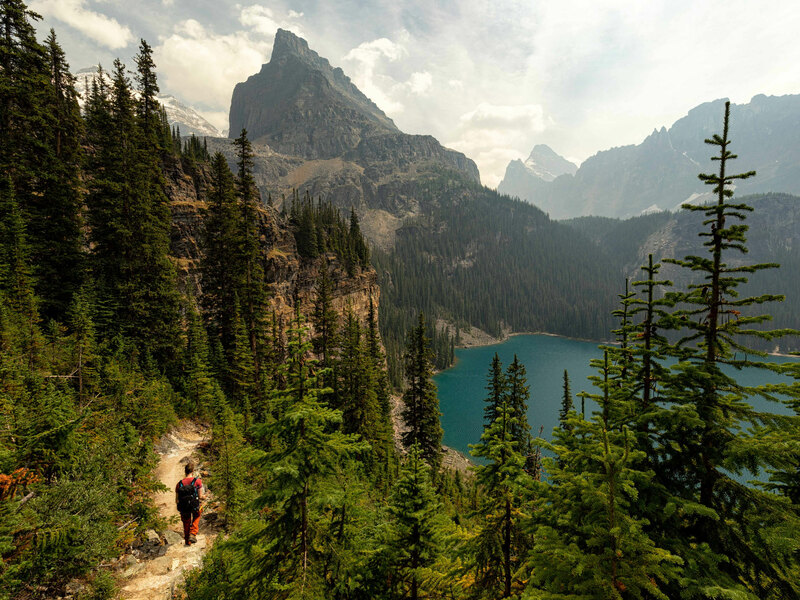 The easiest hike in the park is the lower route around Lake O'Hara. Throughout July until the middle of August different blooming wildflowers brilliantly decorate the well maintained path. What if everything is booked out for the rest of the season? 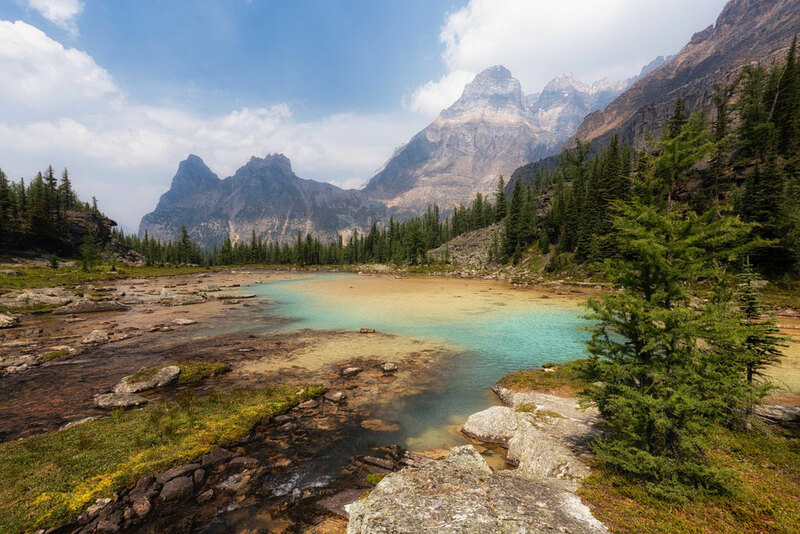 If you weren't lucky enough not to know about Lake O'Hara or you've only just discovered this awesome guide and all the bookings in the campsite, ACC huts and Lodge are gone then fear not. Not all is lost. Because people are forced to make bookings so far in advance, many simply cannot stick to their original arrangements, don't turn up or for example book for 3 nights but end up leaving after 2. Cancellations are quite common. here's no harm in phoning the reservation office and asking if there's any upcoming free spots. You just have to be prepared to be flexible and possibly leave at a moments notice, possibly even on the same day! 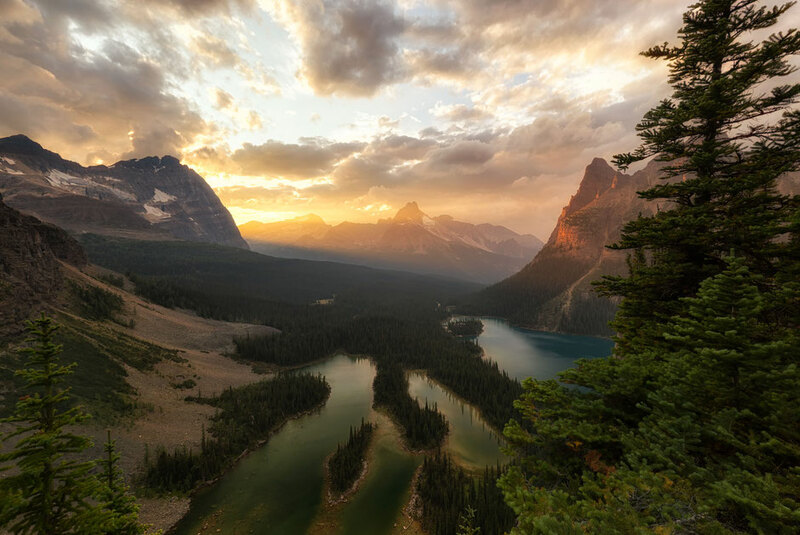 Yoho National Park lies within the subarctic zone, where the winters are long and cold and summers are short but warm. The weather in the mountains is highly unpredictable. Chinook winds, which sometimes occur in this region can raise the temperature over 30 degrees celsius in a day!!! When I was there in August, the smoke from nearby wildfires created a thick haze but overnight temperatures were close to freezing, even in the height of summer. As long as you come prepared for the elements with a warm and lightweight sleeping bag, rain jacket and thermals you will be fine! I highly recommend bringing hiking poles. If you're getting the bus, remember that each guest is limited to one bag. The weight of this bag has no restrictions so fill it with whatever you'd like. No need to worry about bringing only rice and pasta for once! Moreover I've never seen the "one bag rule" being enforced. I've seen many people bringing in several huge wheelie suitcases and big BBQ grills!!! A bit excessive if you ask me, but each to their own. Le Relais is a quaint little lodge situated centrally between the campsite, the ACC huts and the lodge. In the evening it hosts activities such as quizzes, puzzles, talks and seminars. They are mostly aimed at children but I enjoyed them nonetheless. Very informative and interesting. Le Relais also sells goodies. Hot chocolate, tea, coffee, ice cream, noodles, chocolate and their famous carrot cake. I expected it to be much more expensive than it was too. It's very reasonably priced given its location. It's cash only so don't forget to bring some. DO NOT GO WITHOUT BEAR SPRAY. Sing songs, make noise and keep your eyes open for tracks and other signs of bears. Upon encountering a bear DO NOT RUN, make the bear aware of your presence and speak calmly. If it retreats proceed with caution never getting too close, if it aggresses (which is highly unlikely, as bears are very shy animals) then stand your ground and be ready with your spray. Don't worry, bears are more scared of you than you are of them. On my last day at Lake O'Hara I was lucky enough to see a Wolverine, a very aggressive, small creature which are a very rare endangered species. There's a log in book at Le Relais shelter, you can check, to see where the most recent sightings were. I think the restriction in visitors to Lake O'Hara is one of the reasons it's so special. The paths are not over trodden and braided, the trails aren't crowded and there's no litter anywhere. Let's keep it that way! 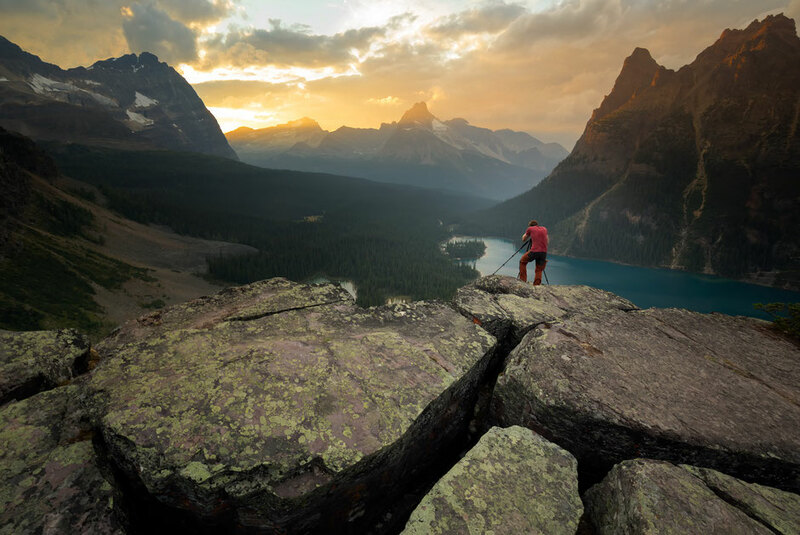 Lake O'Hara, although seemingly impossible to get a spot, is worth the hassle. Being flexible with your dates helps a lot. 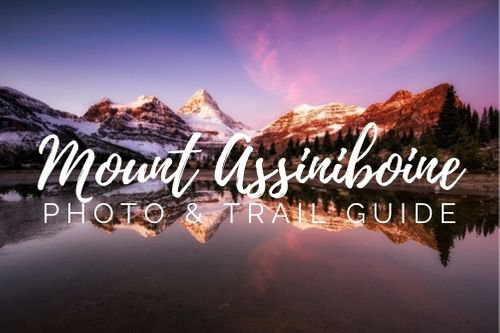 If I you are coming to the Canadian Rockies for a holiday, I would first try and book this excursion and then plan the rest of my trip around it. If you are looking for more backcountry inspiration then check out my top multi-day hikes in the Canadian Rockies.